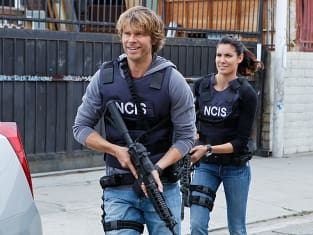 The NCIS: Los Angeles unit has been through more in a few months than any team should have to deal with over years. Despite the hope the Callen found his father and then lost him on the show's 100th episode, there was no concern for how he was handling the death or the information about his real father. The focus of concern shifted back to Deeks and they were on to the next case. Though, it's not like Callen went out an broke the "Unwritten Rule" like Deeks did, so perhaps that's why both Hetty and Kensi were focused on Deeks' recovery and his "heart." When Deeks rode up on the bike, I had equally concerned for his well-being and confident that he was healing appropriately. A motorcycle is a dangerous mode of transportation, but it also allows for physical sensations of freedom while riding. The wind, sound, environment would encapsulate Deeks and help him to let go. Would he have bought the bike if he knew about Hetty's unwritten rule? Probably not. He's pretty scared of her. Though, once he had the bike and enjoyed its therapeutic abilities, he didn't want to let it go. Why would he? Plus, Kensi has a bike. Why should she be any different? The bike was only a symptom of their concern for Deeks though. Hetty's conversation with him before she even knew about his purchase confirmed that. She had no doubt that he was ready for work, but she worried about his relationship with Kensi. He may not have wanted her to play her "Jedi mind tricks" on him, but she did. Deeks may have freed his heart some with the kiss and then his honesty with Kensi, but that only created new, unspoken feelings between the two partners. And, it did become a bit of an issue when Kensi shared her concern for Deeks over the bike. I have mixed feelings about Kensi and her approach to Deeks. She shared that she didn't want him to have the bike because of her belief that it was a reaction to PTSD. While that's a legitimate concern and one that he didn't fully embrace, it did open his eyes a bit. The problem I have is that she stressed their partner relationship as justification for her care and concern. She knows how he feels about her which made it come across as a way to dodge the bigger issue. They were on a case, so maybe that's justification enough ... though it felt more like putting salt on Deeks' wounded heart. At some point, if she doesn't either acknowledge her own feelings or lack thereof then their partnership is bound to fracture and potentially put both of their lives in danger. The next few episodes will likely be a relationship minefield that they both will have to carefully navigate or risk being exposed and destroyed. For now, it looks like even though Deeks isn't an official NCIS agent, the bike's gotta go! Hand over the keys, Deeks. At least he enjoyed it while it lasted and if he needs a rush, perhaps Kensi can take him on ride! The case of the week involving the former Navy officer, William Garrett, and his tech start up company provided for some great character interactions, but that's about it. As soon as the raid involved common thugs and the girlfriend was released, I was sure she was involved. That explained why the abduction took place in a high-profile location and with lots of cameras around. With the recent national security leaks from contractors, it's scary to think about all the people who have could be threatened into turning over top secret technology to American enemies. At least in this case, William thought to put in a fail-safe to destroy the information. He didn't want to betray his country, but didn't see another option. The best part of this case was that Nell got out in the field again. Whenever she gets to leave the tech center, she lets loose and we get to see another side of her. With all her dating woes, I couldn't help but feel like she was at dating social when she arrived that the start up. All the guys were leering at her and she soaked it all up. Of course, Eric didn't appreciate it and his appearance cracked me up. Plus, Nell was carrying a gun. And, she shot it! She looked like a natural with the pistol. She needs to get out of the dark, walls-filled-with-screens room much more often. And, just like Deeks let his feelings for Kensi out, Eric needs to open up to Nell. No more flirting and back-tracking. Just go for it, dude! NCIS: Los Angeles season 5 started out with three extremely suspenseful, stressful and emotional episodes. This was a good episode that held my attention, but it definitely was back to business as usual from the high intensity episodes that started the season. What do you think will happen next between Deeks and Kensi? Should they go back to being partners and ignore what was said? Or do they need to talk about it and move forward?